No..it can’t be! Friday already? They say time flies when you are having fun…I must be having a ball! Well, actually, I am. Still participating in ReFoReMo which means I am reading picture books EVERY DAY! And soon to be starting another month of challenge, RhyPiBoMo. Don’t you love these acronyms? The new challenge is Angie Karcher’s Rhyming Picture Book Month. Last year was an unbelievable success – an intensive month-long workshop of lessons, writing prompts and camaraderie. Oh, and PRIZES! There’s still time to register…just click on the link above to find out all about it. And now it’s time for a Perfect Picture Book review and activity. And if you’d like some more wonderful picture book reviews, please hop over to Susanna Hill’s blog. I had no problem choosing today’s Perfect Picture Book. I just asked my six-year old grandson. Ever since we got this book from the library last week, he’s requested it as a bedtime story. Unicorn was able to make it rain cupcakes. That would be fun. What other things would make for a fun-filled cloudburst? Talk to your child about the different things that might rain – and why some of those things might cause problems. Cupcakes might be cool for a while. Pianos or rocks would not! Have fun with this activity! Draw a picture of your special rainfall. I hope you all have a lovely weekend! Spring is finally here – and I see the snow melting and hear the birds singing – hurray! 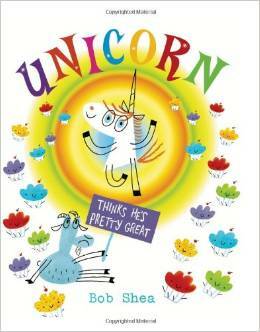 This entry was posted in Perfect Picture Book Friday and tagged Bob Shea, Friendship, picture book review, self-esteem, Unicorn Thinks His Pretty Great by viviankirkfield. Bookmark the permalink. Sounds like you like it as much as your grandson, Vivian! I Love your activities and resources. I think disney likes to teach lessons to kids using animals, don’t you? And it is so effective. Not like a lesson at all. Which is why kids go for it. This story has such a great theme. Great book to share with children at home or school. Love your activity for a cloudburst. Great pick, Vivian. Since it rains so seldom here, as you well know, I love to watch kids’ react to it!! I loved this book – and goat is such a character! Thanks for sharing. Added to my to-read list. I love a book that shows kids how to get along. I loved the humor in this book! Great pick, Vivian!